Are you looking for a Reliable Guide Dog Harness? Do you need it to be of the highest quality? Do you want it to be not just a durable dog gear, but up-to-date trendy item? If so, you can't miss the chance to review and buy this brand-new dog harness designed of pure soft white leather. 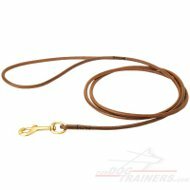 Material is selected manually and it means you will get the finest guidance harness. Only rust-proof luxurious-looking brass hardware is used to equip the harness starting from small rivets up to quick release buckles and rings. 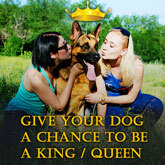 Dog guidance and assistance will be much easier, more comfortable and safer for both dog and a person. Japanese dog trainers and cynologists consider white color to be the most preferable for guide dogs. This product is a number one choice among our customers from Japan. White color is much more vivid than other colors. So hurry up to click 'add to cart' right now and choose in favor of smart harness that will ease the life of a disabled person. It is super comfortable for a dog to wear due to the wide straps (1 ¼ inch - 3 cm) which do not cut or wear into the dog's skin. Your pet will be able to wear it all day long. The hardware is made of brass. It ensures the luxurious look of this product because it shines and looks like gold. The harness is tightly stitched with the strongest nylon thread! 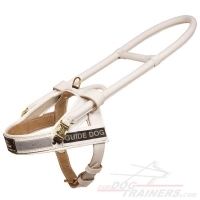 The girth size of the harness can be adjusted with 5 adjustment holes for your dog's comfort. Good fitting is easily achieved provided you take correct measurements; Adjustment of the chest strap should be done once using the roller buckle. 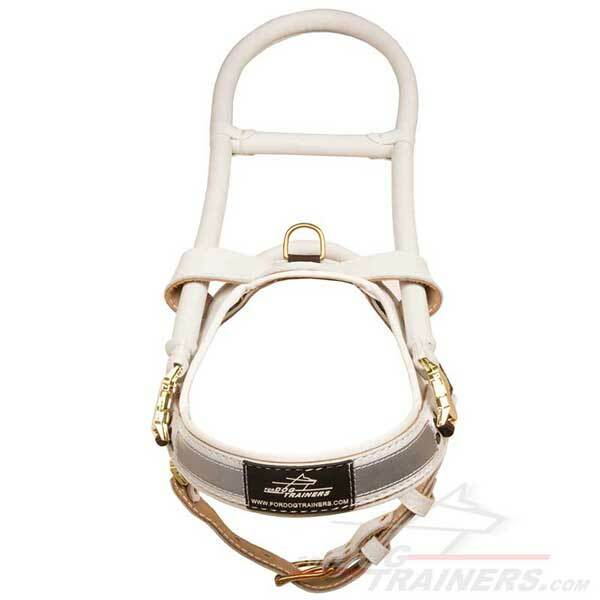 Later on, for placing and removing the harness you can use safe quick release buckle. This harness comes with two handles. One of them is middle handle and the second one is the big one. Both are metal and covered in leather. Middle handle is much of a help when the main handle falls from your hand, it doesn't allow it to fall to low thus you won't have to bend. At both ends of the main handle there is a quick release snap-on buckle. The harness has Velcro patches on each side for your convenience. 3 reflective stripes each placed around the front chest strap which are perfect for night time walks. You will sure appreciate all the advantages this harness possesses. Check also this model in black leather color. Guidance Harness in Snow-White Color. 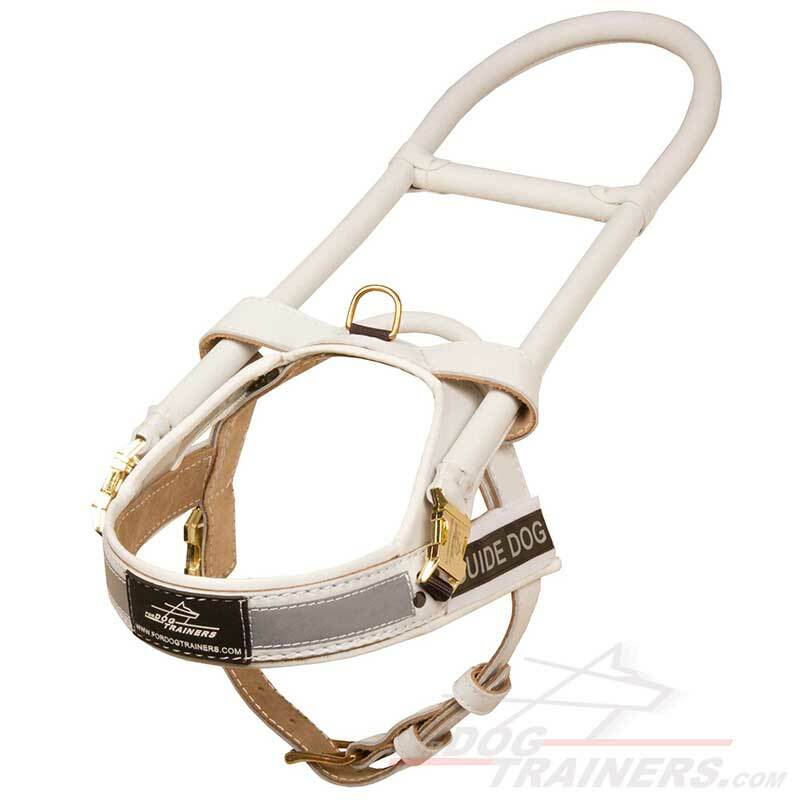 See also budget model of this harness in white color. Guidance Harness made of White Color Nylon.